This is a personal ionic air purifier you can wear around your neck. It uses ionic breeze technology to deliver ion rich air to your mouth and nose, provides you with clean and healthy air wherever and whenever you go. It is your ideal traveling companion. This lightweight, compact purifier can also add moisture to dry air. Simply add water to the hole on the built-in humidifier to enjoy moist and comfortable air. This machine may be driven conveniently by AC or DC power. DC power from 4 pieces of AAA batteries may be use when you are traveling. When you are indoors, AC power may be use by means of the adapter plug provided. Hanger strap may be adjusted to suitable length as required. 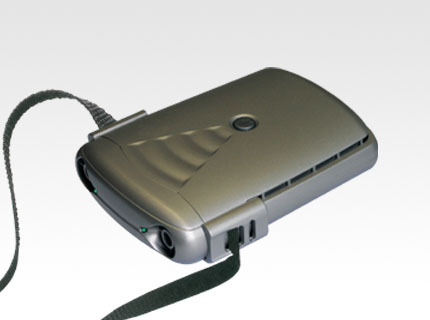 The design is unique and trendy resembling a binocular or a Walkman. It's total weight is only 110g-really portable.